A portrait diamond also known as lasque is a an ancient Indian cut, in which the diamond is cut in the form of a thin slab or sheet, of different shapes such as rectangular, square, pear, etc. with a polished upper and lower surface, and simple facets on the sides. The diamonds were used to cover miniature paintings and therefore came to be known as portrait diamonds. The Russian Portrait diamond covers a miniature portrait of Czar Alexander I, who reigned between 1801 and 1825. Portrait diamonds were designed to reveal features of a miniature portrait covered by it and as such were cut as thin sheets, with well polished upper and lower surfaces. Moreover, only colorless diamonds were suitable for this purpose as it could transmit all light passing through it. Besides only diamonds of good clarity without any inclusions were usually selected for such purpose. Judging by modern color and clarity grades, portrait diamonds would perhaps be D-color diamonds, that are absolutely colorless, with an internally flawless clarity grade. The Russian Portrait diamond is a thin flat pear-shaped diamond, with dimensions of 40 x 29 mm and weighing approximately 27 carats. It is said to be the largest portrait diamond in the world, and covers a miniature portrait of Czar Alexander I of Russia. Portrait diamonds are also a type of table-cut diamonds, the simple diamond cut developed by ancient Indian diamond cutters, in keeping with the simple tools, techniques, and materials available at that time. The original table cuts had a few flat facets, usually cuboidal in shape and without a culet. Examples of such table-cut diamonds are the famous "Grand Table"diamond, the "Dary-i-Nur", and the "Shah Jahaan Table-Cut"diamond. With the passage of time a culet was introduced on one side, but the large rectangular or square-shaped upper table surface was retained. Table-cut portrait diamonds were quite popular in Russia and besides the 27-carat Russian Table Portrait diamond, we come across other portrait diamonds fixed to jeweled "Easter Eggs." The Russian Portrait diamond dates back from the year 1820 during the reign of Czar Alexander I, that lasted between 1801 and 1825. The diamond believed to be the largest portrait diamond in the world, weighing 27 carats, covers a miniature portrait of Czar Alexander I, painted on ivory. The portrait diamond is the centerpiece of a Gothic style, old Indian, gold and enamel bracelet. After Czar Alexander's death the bracelet became the property of the Russian diamond fund, and remains in their custody up to this day. The forerunner of the Russian diamond fund known as the Russian Crown Treasury was started in 1719, by Emperor Peter the Great, to separate the Romanov family wealth from that of the State. Peter placed all state regalia in this fund and declared that all state holdings were inviolate and could not be altered, sold or given away. He also decreed that each subsequent emperor should leave a certain number of pieces acquired during their reign to the state, for the permanent glory of the Russian Empire. Accordingly Peter the Great and his Romanov descendants swelled the coffers of the diamond fund with all kinds of ornaments, such as jewel studded necklaces, earrings, rings, bracelets, brooches, and other royal paraphernalia, such as crowns (diadems), tiaras, royal scepters, swords etc. The Kremlin Diamond Fund has seven celebrated historical diamonds and gems in its collection, of which the flat portrait diamond is one. 1) The 189.62-carat, rose-cut, D-color Orlov diamond, presented to Empress Catherine the Great, by her former lover Count Grigory Grigoryevich Orlov. Catherine got the diamond mounted on the top of the royal scepter, with its domed top facing forward. 2) The 88.7-carat, table-cut, yellow colored, Shah Diamond, inscribed with the names of three former rulers of India and Persia, in Arabic, and presented to Emperor Nicholas I, in 1829 by Fath Ali Shah, the Qajar ruler of Iran. 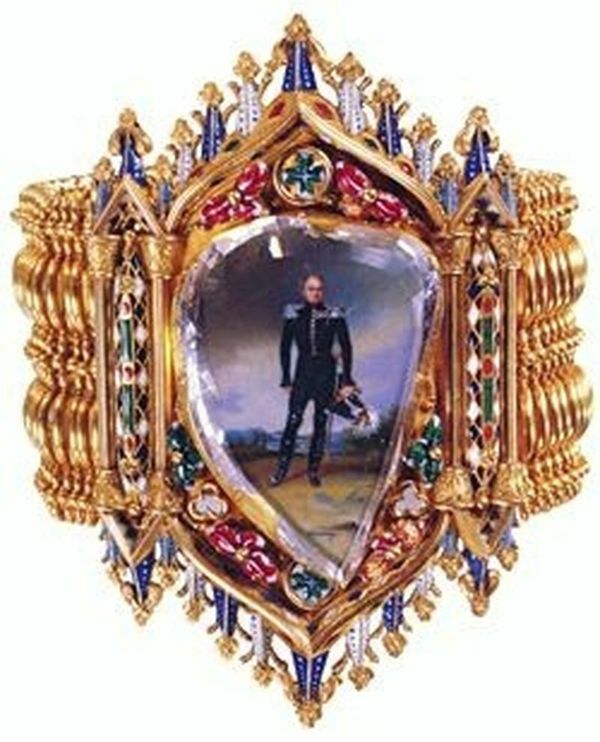 3) The 27-carat flat portrait diamond covering a miniature portrait of Czar Alexander I , set in a Gothic style bracelet. 4) The 398.72-carat red spinel attached to the Great Imperial Crown of Catherine the Great. 5) The 260.37-carat Ceylon Blue Sapphire of exceptional color and clarity, purchased in London in 1862 by Czar Alexander II, and set in a gold and silver brooch containing 56.6 carats of diamonds, and subsequently presented to the diamond fund in 1882. 6) A 192.6-carat olive-green chrysolite. 7) A 136.25-carat Columbian emerald. Previously the Romanov ceremonial regalia, jewels and jewelry were kept in the Diamond Chamber, specially constructed for this purpose by Peter the Great, at the Winter Palace in St. Petersburg. But, with the outbreak of world war I in 1914, concerns were raised about the safety of these priceless treasures, with the expected invasion of Russia by the Germans. The Emperor of Russia at that time Czar Nicholas II, the last of the Romanov rulers who ruled between 1894 to 1917, ordered that the treasures be packed in crates and transferred to Moscow, where it was hidden in the underground vaults of the Kremlin Armory. Then came the Bolshevik Revolution of 1917, and the overthrow of the monarchy, and the subsequent execution of Czar Nicholas II and his family. The treasures were then completely forgotten until they were re-discovered in 1922, in the armory basement, still packed inside their crates. Under the orders of Vladimir I. Lenin every single item among the treasures was photographed and catalogued, and consigned to a specially created entity known as the Russian State Diamond Fund, under the Ministry of Finance. However after the death of V. I. Lenin, when in 1927 the Communist Government of Russia ran short of cash, more than 100 lots of the treasures were sold by public auction by Christie's of London, and was purchased by investors and collectors from around the world, including Americans. The present whereabouts of these sold items are not known. Additional private sales of items also took place in 1931 and 1932, and eventually about two-thirds of the original collection was sold off. What remains of the Romanov collection of jewels and jewelry today is only about one-third of the original collection. Since the fall of communism most of the pieces in the collection have been put on permanent display at the Kremlin Armory Museum. Display of the Russian Portrait diamond in the United States. The Russian portrait diamond as the centerpiece of the original Gothic style gold and enamel bracelet together with some 200 items from five major Russian collections, including the Russian Diamond Fund, were displayed at a special exhibition held in several cities of the United States in the year 1997, to mark the 125th anniversary of the visit to the United States by the Grand Duke Alexei in 1871, fourth son of Czar Alexander II , who ruled between 1855 and 1881. The exhibition also displayed documents and memorabilia relating to that historic visit made at the invitation of President Ulysses S. Grant to thank Czar Alexander II, for sending naval squadrons to U.S. shores during the civil war to discourage foreign intervention. 1) A spectacular brooch set with a 260-carat Ceylon Blue Sapphire of exceptional color and clarity, surrounded by 56.6 carats of diamonds. The stone with a medium dark saturated blue color was purchased by Czar Alexander II in 1862, and presented to the diamond fund in 1882. 2) Caesar's "Ruby"- This is a 52-carat egg-sized pink tourmaline (rubellite) formerly thought to be a ruby and said have belonged at one time to the Roman Emperor Julius Caesar. The massive semi-precious stone carved in the form of a bunch of grapes is set in a unique pendant. A gold stem and enamel leaves were added in the 17th century giving it a raspberry like appearance. This unique pendant was given as a gift to Empress Catherine the Great by King Gustav of Sweden, in 1777, during an official visit to Russia. 3) A loose collection of about ten rough and polished alexandrite gemstones, with unique color changing characteristics. Alexandrites were first discovered in the Ural mountains of Russia, in the year 1831, and was named after Prince Alexander, the eldest son of Czar Nicholas I (1825-55), who subsequently succeeded his father as Czar Alexander II (1855-81). The unique characteristic of alexandrite is its color changing ability. While in normal daylight the stone appears to have a green or bluish green color, in incandescent light the color of the stone changes to red or purplish red. Alexandrite was the national stone of Czarist Russia, as the colors green and red were important colors in the imperial flag of Russia. 4) A pair of diamond and ruby earrings in the form of cascades. 5) An 18th century diadem made by jewelry designers in Russia in 1760, designed as a garland of flowers beset by bees. The tiny diamond bees are attached by small springs, and with the movement of the wearer the "bees"appear to be moving and buzzing over the blossoms. The unique diadem is accompanied by a pair of earrings also shaped like bees. 6) A reproduction of the spectacular "Russian Field"diadem made in St. Petersburg for Empress Maria Feodorovna, consort of Czar Nicholas I, designed in the shape of laurel leaves and sheaves of wheat, in diamond and gold, and consigned to the diamond fund in 1828. The original diadem was sold off in 1927, during difficult times, by the Government of Russia. The show that was first of its kind organized outside of Russia, was the first time that the treasures of the Romanov period ever left Russian soil, and was jointly organized by the American Russian Cultural Co-operation Foundation (ARCCF) and the Russian Organizing Committee, headed by Deputy Prime Minister Vitaly Ignatenko. The exhibition was held in several American cities such as Washington, Houston, San Diego, and Memphis. Table portrait diamonds had been used in different jewelry settings in Russia. One such setting was the famous jeweled "Easter Egg"and other "eggs"produced during special occasions such as the "Coronation Egg"and the "Fifteenth Anniversary Egg." Easter Eggs -The Kelch hen egg also known as a "Faberge Egg"was designed by the Russian jeweler Peter Carl Faberge, and the workmanship was carried out by Michael Perchin in 1898. It was a gift by Alexander Kelch to his wife Barbara Kelch Bazanova. The length of the egg is 8.4 cm. The egg has a translucent, strawberry red, guilloche enamel exterior, divided into two halves and opens horizontally in the middle. The border of the hinged cover is set with small diamonds all round, and the thumb piece where the two halves fit, is mounted with a table portrait diamond that covers the year 1898, the year of production of the masterpiece. Another table portrait diamond mounted at one end of the egg, covers a miniature of Czar Nicholas II, and is encircled by other smaller diamonds. When the hinged cover which represents the upper half of the egg is opened, it reveals the opaque white enameled "white"part of the egg and the hinged opaque yellow enameled "Yolk"of the egg. When the "yolk"of the egg is opened, it reveals a gold colored hen, also made in two halves, enameled in translucent shades of orange, yellow, red and brown. The interior of the "yolk"that houses the golden hen is lined with suede. The eyes of the hen are set with diamonds, and the two halves of the hen are hinged at the tail, and the upper half of the hen can be opened backwards, revealing the surprise contained within, in the form of a gold easel and frame set with rose-cut diamonds, containing a miniature portrait of Tsarevich Alexei Nikolaievich. The finial of the easel is mounted with a heart-shaped diamond and a flame carved ruby, and on top of the frame is a diamond set ribbon bow. The Imperial Coronation Egg is another jeweled "Faberge Egg"made under the supervision of Peter Carl Faberge, by craftsman Mikhail Perkhin and Henrik Wingstrom, to commemorate the 1896 coronation of Czar Nicholas II. The Coronation Egg was presented as a gift to the Empress consort of Czar Nicholas II, Czarina Alexandra Fyodorovna, on the Easter of 1987. The egg has a translucent, gold colored guilloche enamel exterior, with a large portrait diamond set on the top of the egg, surrounded by a cluster of ten brilliants. A monogram of the Empress can be seen through the portrait diamond. A second and smaller portrait diamond is set at the bottom of the egg, surrounded by a cluster of rose diamonds beneath which the year 1897 is inscribed. When the egg is opened it reveals a velvet lined compartment that houses a roughly four inch long miniature replica of the Imperial Coach that carried Czarina Alexandra Fyodorovna to her coronation to Moscow's Uspensky Cathedral. The "Fifteenth Anniversary Egg"is another Faberge Imperial Easter egg, presented by Emperor Nicholas II to his Empress consort Alexandra Fyodorovna on Easter 1911, to commemorate the 15th anniversary of their coronation. This Easter egg was one of the most elaborate of all the Easter eggs, with the shell of the egg divided into 18 panels, bordered by green enameled leafage. Sixteen of the panels are occupied by 16 miniatures, of which seven are oval portrait miniatures of the Imperial family within diamond-set borders. The other nine miniatures are nine historical scenes from the reign of Nicholas II. The remaining two panels on the shell are occupied by two oval shaped reserves with diamond set borders enclosing the dates 1894, the year of wedding of Nicholas and Alexandra, and 1911, the year of the fifteenth anniversary of their coronation. The top of the egg was inscribed with the Imperial monogram of Alexandra Fyodorovna covered by a round-shaped table portrait diamond, surrounded by a diamond set border. The bottom of the egg was also mounted with a diamond encircled by a diamond-set border. The egg was supported by a gold tripod stand.